30 Leads in each tube. Available in 0.5mm & 0.7mm. for general writing. Fits Pentel's Automatic Pencils and major competitors. Great for accounting, puzzles, school and general writing. 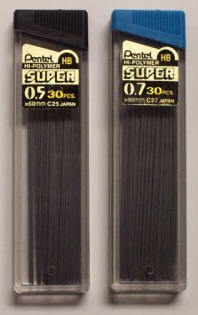 HB hardness lead is perfect for general use and is equivalent to a #2 wooden pencil. Produces a smooth, crisp line with dark imprint for easy reading. Each lead piece writes as far as a wooden pencil.